The 2016 Bilderberg Meeting will take place from 9-12 June in Dresden, Germany. Austria last year now this year`s meeting definiteley takes place in Dresden 9-12 June 2016 - Bilderberg takes us all by surprise! I suppose security will be easier to organise and it should be a Trump - free zone but it does seem a strange choice of location and a departure from previous Bilderberg practice and tradition. No leaks this year other than the official Bilderberg's site; helas ! High-ranking representatives from politics and business meet annually for informal Bilderberg conference. This year in Dresden. At the Bilderberg conference, politicians and representatives of business, discreetly exchange, now a newspaper is reporting that this year's meeting point known. The Bilderberg conference of high-ranking representatives from politics and industry will take place this year, apparently, in Dresden. The Meeting will be there from 9. to 12. June held, said the Federal Ministry of the interior according to the Berlin-based "tageszeitung" . From the environment of a participant, the Kempinski Hotel taschenberg Palais, close to the Semper was called accordingly-Opera as the venue. The Bilderberg conference met for the first time in 1954, at Hotel "De Bilderberg" in the Dutch town of Oosterbeek. It ends without final Declaration, there are no written decisions, and the discussions little penetrates usually to nothing to the outside. Participants are usually more than a hundred leading representatives from politics, the economy and the financial world. Critics accuse the Bilderberg group for a Long time to meet at your conferences, major political and economic decisions without democratic legitimacy and public control. Other critics of the group, for an ultra-liberal orientation of globalization. 1. Ground zero of bad Allied practice during WWII with the 13/14 February 1945 fire bombing of the city which left 24,000 mostly civilian deaths. Remember the war was almost over. Surely a war crime. So lots of scope for painting Germany as the victim here. FRANKFURT, Feb. 17 — Dresdner Bank helped finance the construction of the Auschwitz death camp and was the bank of choice for Hitler's feared SS paramilitary, according to an independent report on the German bank's dealings during the Nazi era, released Friday in Berlin. The findings in the 2,400-page report are not entirely new, but they serve as a blunt reminder that Dresdner Bank, one of Germany's largest banks, was an early, enthusiastic supporter of the Nazis, benefiting from personal ties between its bankers and SS commanders. "Without the help of the bank, the SS could not have constructed its large network of business interests," said Harald Wixforth, a historian at Ruhr University in Bochum who wrote one of the report's four volumes. "Dresdner Bank participated in many ways in the crimes of the Nazi era." Most notoriously, Dresdner financed, and owned a stake, in a construction company that built some of the crematoriums at the Auschwitz camp in Poland. Mr. Wixforth said Dresdner's bankers were aware of the camp's purpose, and encouraged the company to take on the contract. Dresdner Bank is the latest of several German companies to hire outside scholars to research their wartime history. Volkswagen, Deutsche Bank and Bertelsmann have released such studies, while Commerzbank is expected to publish the last installment of its report next year. In Dresdner's case, this public act of reckoning was also a response to withering criticism of the bank by Holocaust survivors in 1997, when the bank all but erased the Third Reich from its 125th anniversary commemoration. The former chief executive, Jürgen Sarrazin, relegated the bank's dealings with the Nazis to a single sentence in a lengthy speech. Speaking in Berlin on Friday, the current chief executive, Herbert Walter, said the criticism of its selective memory was justified. "Dresdner Bank took it to heart," he said. "It was a belated awakening." Like other big German banks, Dresdner has tried, with mixed success, to remake itself into a global financial institution. In 2000, it acquired Wasserstein Perella & Company, a New York investment bank. A year later, the Munich insurance giant, Allianz, acquired Dresdner. In recent years, Dresdner has burnished its image by raising money to rebuild the Church of Our Lady which was destroyed in the Allied bombing raid of Dresden, its hometown, in February 1945. But the bank's wartime past has dogged it. Soon after its disputed anniversary celebration in 1997, Dresdner commissioned four historians, led by Klaus-Dietmar Henke, to sift through its archives, here and abroad, to document the bank's involvement with Nazi organizations. The project took six years to research and a seventh year to write. Mr. Wixforth said he visited 35 archives in Germany, Poland, and the Czech Republic for his volume of the series, which focuses on Dresdner's expansion outside Germany during the Third Reich. "This is by far the most detailed study of any German enterprise during the Nazi period," he said. Dresdner demonstrated its fealty to the Nazi Party early on, when it purged Jewish bankers and put two party members on its board. The bank's main link to the SS was Oswald Pohl, a top SS commander who directed its economic activities, which included stripping and selling the personal possessions of Jews brought to the concentration camps. Dresdner's ties to the SS were long known, but Mr. Wixforth said the researchers turned up records of money transfers that demonstrate the extent of the links. The bank lent the SS more than 47 million Reichmarks, helping it amass interests in quarries and porcelain manufacturing. Two years ago, Mr. Wixforth said, the researchers uncovered the evidence of Dresdner's role in Auschwitz. The bank held a 26 percent stake in a construction company of the time, Huta Hoch- and Tiefbau, which had a contract to build crematoriums at the camp in Poland. Chancellor Angela Merkel has been invited to attend the 2016 Bilderberg conference in Dresden, Germany, the annual meeting of elitists which some accuse of being a secret cabal that manipulates world events. According to a German-language Huffington Post report, which cites the Die Tageszeitung newspaper, Angela Merkel herself is on this year’s guest list and will meet with over 100 globalists from business, banking, media and academia. Germany’s Federal Minister of Defence Ursula von der Leyen will also attend the confab alongside Federal Minister for Special Affairs Peter Altmaie and Sigmar Gabriel, the Vice-Chancellor of Germany. They will be joined by Frank-Walter Steinmeier, Germany’s Foreign Affairs Minister. Left-leaning German economist Axel Troost criticized Merkel’s involvement, accusing her of being at the mercy of lobbyists and insisting that, “Government officials should not as a matter of principle” be allowed to participate. Condemnation also came from the right, with publisher Jürgen Elsässer revealing that he would support protests against Bilderberg. Merkel’s attendance is notable given that she has overseen a policy which has led to a huge migrant influx into Germany. A new poll finds that two-thirds of Germans think she should not run for re-election in 2017. It is according to the will of the steering Committee of the Bilderberg group (Bilderberg conference: "This is an absolutely before the democratic event"), this year the political leadership of Germany in the Elite Meet to participate. German Chancellor Angela Merkel, defence Minister Ursula von der Leyen, Finance Minister Wolfgang Schäuble, the Minister for Special Affairs Peter Altmaier, the Deputy Chancellor Sigmar Gabriel and foreign Minister Frank-Walter Steinmeier to the Bilderberg conference, from 9. to 12. June in Dresden will take place (Bilderberg conference: the power elite meets in Dresden), invited. DIE BILDERBERG ELITE TRIFFT SICH ALLJÄHRLICH. DIESES MAL FINDET DIE BILDERBERG KONFERENZ IN DRESDEN, VOM 9.JUNI 2016 - 12. JUNI 2016 IM KEMPINSKI-HOTEL, TASCHENBERG 3 IN 01067 DRESDEN STATT! AUF DIE STRASSEN! AUF NACH DRESDEN! Du weißt nicht was die "Bilderberger" und die "Bilderberg Konferenz" ist? Dann übernimm bitte Eigenverantwortung und informiere Dich eigenständig überall im Netz. UND KOMM IM JUNI NACH DRESDEN! 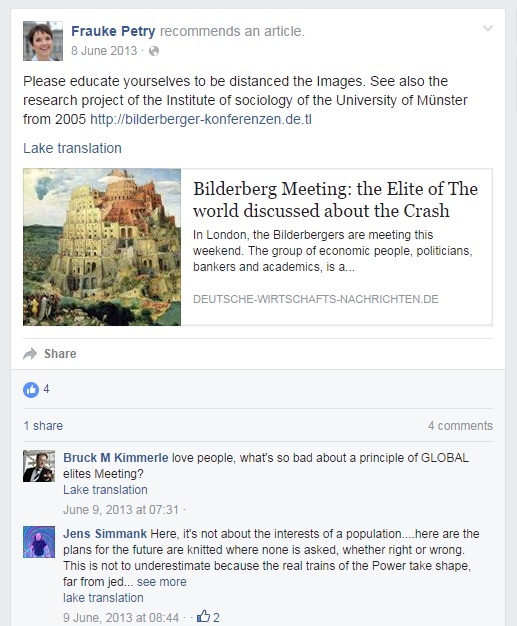 Bilderberg conference: "This is an absolutely before the democratic event"
In June the Bilderberg conference held in Dresden (Bilderberg conference: the power elite meets in Dresden). "Democracy needs transparency and legitimacy. Both the Bilderberg conference completely. This is completely unacceptable," says the Chairman of Saxony's left party, Rico Gebhardt, in an Interview with Telepolis and announces that for the Left, the Meeting of the Mighty is also a topic in the Parliament. Thoughts makes Gebhardt about a possible to each other left and right protest groups to meet. Both camps criticise the Elite gathering. ("It's not a real mess, that in a democracy interests?"). When did you first heard of the existence of the Bilderberg group? Rico Gebhardt: Well, to be honest: even at the time of the announcement of the conference in Dresden. This is not a topic that is in the political operation on a daily basis. By the Geheimheit of the Meeting rather it is a story that will be discussed in detail in the relevant forums, then, in most cases, with a neat swipe of the world conspiracy, and beyond the real criticism line. For The Left party, however, this is not a new issue. There are some who have studied the subject and could give me accordingly, intensive "tutoring". But the lack of knowledge about the conference is ultimately created in your character. The taz quotes the Prime Minister Stanislaw Tillich with the words: "I am delighted that the key decision-makers of Dresden as the venue chosen." How do you think about that the next Bilderberg conference will take place in Dresden? Rico Gebhardt: This is completely absurd. Prime Minister Tillich was pleased that the good advertising for the business location would be in Saxony, and for investors. Such Statements, given the nature of the Bilderberg conference to reveal a certain simplicity to the dance on the international stage. Where is your criticism of the conferences, exactly? Rico Gebhardt: What Tillich apparently not understood: It is private, so secret Meeting of self-appointed decision-making elites in the sense of a neo-liberal community of values. In politics, you would call the coterie round. As decision-makers from the economy with hand-picked and ideology audited representatives of the policy and discuss a political Agenda. This is an absolutely before the democratic event. Democracy needs transparency and legitimacy. Both of the Bilderberg conference is complete. This is completely unacceptable. We are more on the "democratic idea". The Bilderberg meetings are sealed off to the outside, what is said at the conferences, it remains, by and Large, a secret. Could you imagine as a politician under these conditions, to participate in this conference? Rico Gebhardt: of Course not. As I said: politics of transparency and legitimacy. The lack of both, should anyone who takes the policy seriously, from a participation gap. The legend Bilderbergers lives but, above all, that economic, neo-liberal influence of elites hand-politicians-picked for an interview ask for and in the Secret of their Agenda to make bobbin lace. What should be discussed and developed: Any lack of transparency is forbidden in the democratic process. I draw a comparison: Munich security conference meets each year as a Meeting of the international Security policymakers, military and military-industrial, and discussed completely unasked security policy issues. So a Meeting will not remain without influence. Of course, the impact on future decisions and Considerations of these groups of people. But this Meeting, any legitimacy is missing. And yet they influence the way our global living together. This is completely unacceptable. However, there is A difference. At least I know at the Munich security conference, who has said what, because that will be open to the public. That is not at the Bilderberg conference in the case, delegitimized twice. Now you might be quite also of the opinion that politicians want to talk with other elites in the world of politics, without you, is not required because the Public is, every word on the gold balance. Accordingly, the Bilderberg-conference, just as "chatting hour" of the Mighty lane. There is something you counter this argument? Rico Gebhardt: It is open to anyone, with any Time to chat. But let's be honest: the Institutional organization of an informal conversation framework makes the thing quite simply illegitimate. Point. From. At the end of. You and your party deal with the Bilderberg conference in Dresden? Rico Gebhardt: Yes, of course. We are currently reviewing the appropriate forms of action. If I criticize, that the Bilderbergers as a class of the neo-liberal meeting have actually no right to be with public money shielded, I need to think about what is actually a sensible Protest, which legitimised in retrospect, the police protection. We will see. We are not uncreative. Also in Parliament, we are, in any case of our question right to the state government requesting it to inform us about the planned costs in connection with this private event. At least this transparency in "the topic of Bilderberg" we can manufacture. What do you mean, how will the citizens in Dresden? Will there be protests? Rico Gebhardt: Whether the citizens of Dresden will be, I know not. However, Dresden is currently a Hotspot of the Germany-wide demonstration events. Especially the right-wing. Think of Pegida. I'm sure the extreme right, together with the usual Suspects of rich citizens and Aluhüten are trying to make the Protest and to put in your Agenda. That is, in the end, a demarcation problem for us: We must make our Protest and our Protest so that he can not be confused with the right wing. At the same time, a confrontation of a protest from the left and to the right is a Problem, because that can overlay our actual concerns of the criticism of the Bilderberg conference. We are facing a real brainteaser. I'm sure that we will be the masters. But national ones keep their mouth shut! just a few days ago Paul Watson from infowars published an article, which was very badly researched. He basicly just copied stuff, which he had found in an article in the huffington post. That's bad journalism, Mr.Watson !! I really expected more from an employee of Alex Jones and prisonplanet. The fact is, while the local organisations of the new German patriotic party AfD have protested against the Bilderberg meeting in Dresden, the national leaders of this party didn't and they had ample opportunities to do so. They had a national party conference at the 30th of April and the 1st of May in Stuttgart and could have easily made a statement against this conference, which had been a powerful signal, but they didn't. And their popular leader Frauke Petry could have easliy mentioned this Bilderberg meeting at one of her countless talkshow appearences and by doing so she would have reached millions of German viewers, who in their vast majority have never heard about this meeting. This way she could have enlightened millions of citizens and made them familiar with this term 'Bilderberg', but she didn't and this is very suspicious indeed. But the big conspiracy theorists and self-proclaimed Bilderberg experts Paul Watson and Alex Jones don't mention this dubious behaviour of the leaders of the AfD with one word, although I had already informed both of them of this Situation more than a week ago. Well, still a lot to learn for this 2 truth seeking activists. of this blog and thats very suspicious as well. Bilderberg conference in Dresden: calls on The barricade, standing You off! Die application of the anti-fascist rally against the Bilderberg conference under the Motto "Germany says' no 'to imperialism and war" is for the range bag mountain (the Hotel), to the theatre square (Semper Opera), the two places are about 50 meters apart. The set-up is from 08.00 PM participants should arrive by 09.00 hrs, the duration of the rally is logged up to a maximum of 18.00, this time frame but must not be exhausted. Currently, it is still advised, as the continuation of the protests on the other days, to 12.06. is to be made. We have asked the parties AfD and the so-called left party, official of the press information, as in the media on the basis of Statements of individual party members, it was reported that these would also plan protests. Up to today, but still no answers, so it is currently unclear whether these parties are actually, and if you carry out so, in what Form actions. The AfD wanted to confirm until today our editorial staff or deny whether Frauke Petry, or other party members will participate in this year's Bilderberg conference in Dresden. The same left party, which has so far neither confirmed nor denied whether the Bundestag will participate Deputy Stefan Liebich, who is by his own admission, also a member of the imperialist organization “Atlantik-Brücke”, or possibly even other party members apply for the so-called. Die this year's Bilderberg conference in Dresden  is on the one hand a provocation by the Imperial Bourgeoisie, but on the other hand, the Chance for democratic Germany to claim. We share with you this historic challenge, we accept common historical responsibility. With the Bilderberg conference, all of the relevant issues of our era; imperialism/NWO, NATO, war and peace, TTIP and co., anti-fascism, democracy and social justice. Germany says ' NO ' to imperialism and war! Bilderberg Conference 09. June 2016 in Dresden block! Up to here and no further! There is no Bilderberg-conference in Dresden! - Share this call-in groups and their private environment, motivate your friends to participate in the protests. 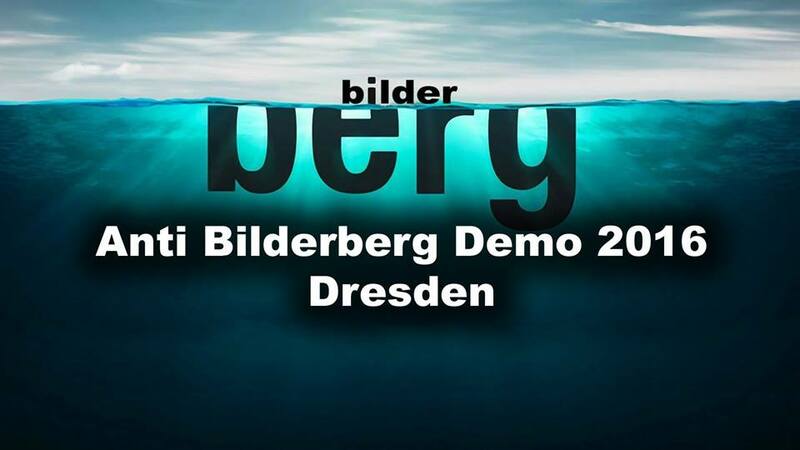 - The actions against this year's Bilderberg conference in Dresden will begin already NOW, in the weeks prior to the date 09. to 12. June. Everyone can contribute with their own initiatives. - You can use the following files, with which you will be printing even Banner making. Not to be confused with the anti-fascist action (with the secret service orchestrated the “Antifa”) is an Alliance that is open to all anti-fascists. Alternatively, you can design your own Banner. The barricade calls, stand You away! This brand is not fatal: it Leads to imperialism, fascism and war! Bilderberg Conference 09. June 2016 in Dresden block! Peace movement and anti-fascist action have created the first Banner motifs, the attached files (150 x 100 cm) suitable for products in printing that can give to each one in order. The purpose of the Banner is, as of now (in Dresden, and other places) to show off in all sorts of Places the flag against the Bilderberg conference, to hang, for example, from the window of public buildings and roofs, etc. Dresden can't make it for the press and the Public, and are visible from the Bilderberg conference is welcome! GERMANY SAYS ' NO ' TO IMPERIALISM AND WAR! Bilderberg Conference 09. June 2016 in Dresden block! Von Thursday 09. June to Sunday 12. June 2016, the Imperial Bourgeoisie holds this year's conspiratorial Bilderberg conference at the Hotel Taschenbergpalais Kempinski, taschenberg 3, 01067 Dresden. The democratic Germany says: Until here and no further! There is no Bilderberg-conference in Dresden! What is the Bilderberg conference? Around the topic of Bilderberg conference, which met for the first time in 1954 in the Netherlands and then annually in different countries, there are different assessments of, and debates on the nature of this event. This is due to the fact that the content of the conferences are confidential, and no information to the outside world to penetrate, although in addition to private industry representatives and the media, also tax-funded function carrier from the official policy, the military and intelligence services among the participants. Similar to the Atlantic bridge, the world economic forum or the NATO-security conference (Munich security conference) is also at Bilderberg, to formal private events, which take place beyond the democratic-Republican legitimacy, which will be financed through guided tours but from public funds. It can be objectively accounted for, on the conferences policy on a global scale will be discussed, without the democratic Sovereign has issued an order, the whole thing resembles more of mafia and anti-democratic conspiracy. The Bilderberg conference fits seamlessly into the structures of TRANS-Atlantic networks, was at the Foundation; "the increasing Anti-Americanism in Europe and the Cohesion between the power elites on both sides of the Atlantic, as well as the Europeanisation of movement to strengthen, a closed Alliance of the West against communism." The first Bilderberg meeting in may 1954, followed in October 1954, the announcement of the accession to NATO of the Federal Republic of Germany, which was completed in 1955. Stanislaw Tillich from the CDU. Currently he is the president of Germany's second chamber, the Bundesrat, as well. He is quoted as looking forward to the Bilderberg meeting and being happy about the fact, that Bilderberg chose Dresden as their location. Dresden. Die Organisatoren der internationalen Bilderberg-Konferenz haben zur Jahreskonferenz in Dresden hochrangige deutsche Politiker wie Bundesratspräsident Stanislaw Tillich (CDU) eingeladen. Laut Antwort der Staatskanzlei auf Anfrage des Linke-Abgeordneten Enrico Stange nimmt Sachsens Ministerpräsident "ausschließlich an einem Abendessen teil". Weitere Einladungen hat das halbe Bundeskabinett erhalten: Bundeskanzlerin Angela Merkel, Finanzminister Wolfgang Schäuble, Verteidigungsministerin Ursula von der Leyen, Kanzleramtschef Peter Altmaier (alle CDU), Wirtschaftsminister Sigmar Gabriel und Außenminister Frank-Walter Steinmeier (beide SPD), wie die Bundesregierung ebenfalls auf Linke-Anfrage mitteilte. Wer davon vom 9. bis zum 12. Juni im Taschenbergpalais dabei sein wird, ist offen. Laut Bundesregierung handelt es sich um einen "informellen Gedankenaustausch über aktuelle, politische, wirtschaftliche und gesellschaftliche Themen". Die - noch nicht bezifferbaren - Kosten des Polizeieinsatzes zur Absicherung des so umstrittenen wie elitären Treffens trägt Sachsen. Angela Merkel, 5 of her senior ministers and the governor of the state of Saxonia. By the way the mayor of Dresden, Dirk Hilbert from the FDP, the so called liberal party, is very happy about this meeting as well. According to him it will 'enhance the reputation of Dresden' and will be good for business. Interesting enough he also mentioned that he himself was already informed about the meeting in December of last year (2015). So at least he is able to Keep his mouth shut, although he was actually directly elected by the Dresdener people and not by the Bilderberger. And interesting enough the leading figure of this party, Frauke Petry, was born in Dresden, still lives in Dresden, is a member of the federal parliament of Saxonia which resides in Dresden and is the leader of the parliamentary group of the AfD in this parliament and You know what? This parliament building is just a few blocks away from the Kempinky Hotel and there will be several official parliamentary working group sessions happening at the 9th and the 10th of June. She obviously got her priorities a bit mixed up !! Although three years ago when she was completely unknown she posted a very critical comment about the Bilderberger on her Facebook site. International appeals ... but none in English...? I wonder if perhaps there is prejudice here over using the language most US and European listeners, readers, viewers will understand - English - this apparent inability to step outside the German language is likely to keep foreigners away from Dresden...? The beginning of this year's Bilderberg conference is approaching ( Bilderberg conference: power elite meet in Dresden ): From 9 to 12 June around 150 important people will meet in Dresden together with the exclusion of the public to speak about social and political issues ( Bilderberg conference: leaders of the CDU and SPD invited ). This time it happens: Three CDU Minister of the Federal Government. Defense Minister Ursula von der Leyen, Federal Finance Minister Wolfgang Schaeuble and expected Interior Minister Thomas de Maiziere said to have accepted the handpicked invitations exclusive circle, as the SÃ¤chsische Zeitung (SZ) on weekends reported . The Prime Minister of Saxony, Stanislaw Tillich, will attend a dinner with "Bilderbergers". According SZ both SPD politician Sigmar Gabriel and Frank-Walter Steinmeier, as well as German Chancellor Angela Merkel have canceled the invitation to participate in the conference . Meanwhile, the security arrangements are in in full swing. Like the SZ reported 20 protests have been announced so far. The spectrum ranges from "the right-wing extremist NPD to the artistic and social project Love Storm People". Last week, a right alliance posters placed in prominent places in Dresden, was to read that read: "No space (or: place) for Bilderbergers". A 30-member crew of the police has to protect the elite circle ( Bilderberg conference: "This is an absolutely pre-democratic event"). The entrance area of â€‹â€‹Taschenberg hotels, the Bilderberg group has fully rented will, is demarcated by a security fence. The location of the meeting was deemed "safety zone 1", the access was "forbidden to the general public", is it in the SZ citing the Dresden police director and director of operations, RenÃ© Demmler. In addition, there is a "safety zone 2", which could be completely blocked by the police, if it necessitated the circumstances. This encompasses the "little BrÃ¼dergasse, Sophienstrasse and the open space in front of the Green Vault". The meeting of Bilderberg is located right in the downtown area of â€‹â€‹Dresden, near the Semperoper, Zwinger and the Castle. The Dresden police have so Demmler, obtain first clues to the Bilderberg conference earlier this year. However, it was here that a meeting "of the Airbus Group" was imminent. The Superintendent himself had only learned through press reports that it concerns the meeting of the Bilderberg circle at the meeting. The statements of Demmler what Bilderberg was the authorities did not disclose information about the meeting, but given a different group name, reminiscent of the Bilderberg 2005 meeting in Rottach-Egern. There was talk before the meeting of an international conference of medical professionals. That this kind of deception nourished the suspicion that the Bilderberg Group would lead to no good, is close. Since 2010, the elite circles the Internet is through your own website represented. Until that time, Bilderberg was not publicly available. Meanwhile Bilderberg also offers a contact address for members of the press via email. It remains unclear what subjects are on the agenda of the group this year. Last year, as Bilderberg has come together in a shielded location in the Austrian Telfs-Buchen, representatives from business, politics, media and military said among other things, a "European strategy", "NATO", "Russia" and " US elections ". At the meeting in 2014 in Denmark, it was supposed to questions like: "What's next for Europe", privacy still exist "and" Is the economic recovery sustainable "?